I recently picked up shares in the LGL Group (LGL). I stumbled on them when I was researching a competitor (CTS) who hit a 52 week low. Of course, as soon as I purchased shares, the price declined by 10%. They just reported numbers and they were essentially what I was expecting, but the market may push this one down at the open tomorrow. We will have to see what is said on the conference call tomorrow. Here is a (somewhat) detailed analysis. CTS operates in 2 major segments. 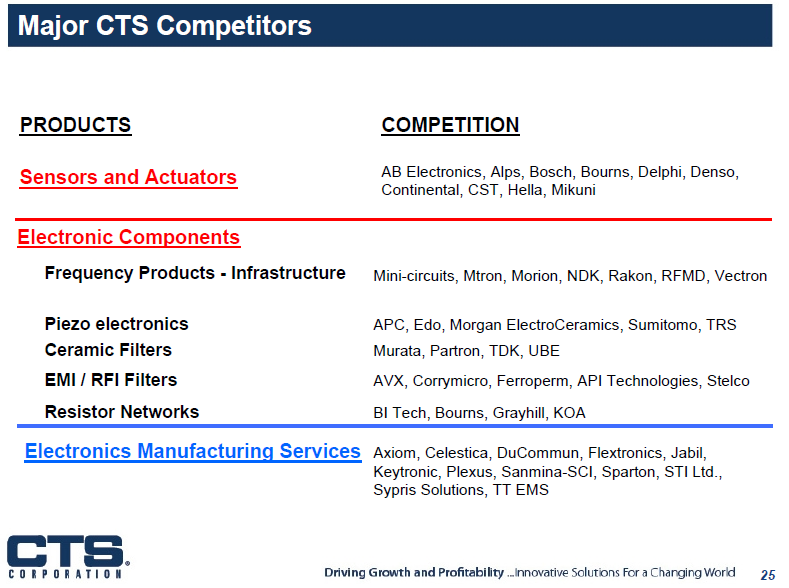 Components & Sensors and EMS (Electronics Manufacturing Services). Here is how the two segments have been performing. We can see that the two divisions have different dynamics. I should note that I have not removed corporate expenses from the division results as I am just looking for data on how the divisions are performing. 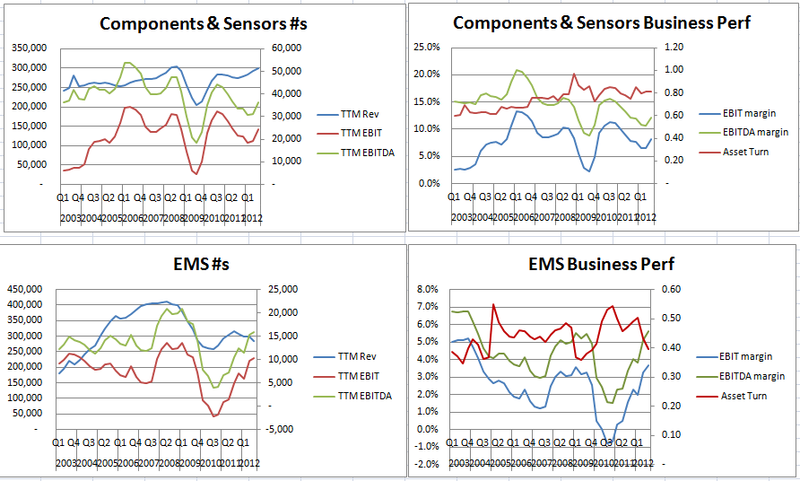 Components and sensors have better top line performance over the period and margins are also better. Here is a picture of a slide from the CTS investor presentation. It lets you know some of the other players in the respective markets. Sensors and Actuators are controlled by a couple of major American and Japanese players and then a fragmented rest of the market. In the Frequency Products we see LGL’s major division Mtron. Another company I took a look at was RFMD. 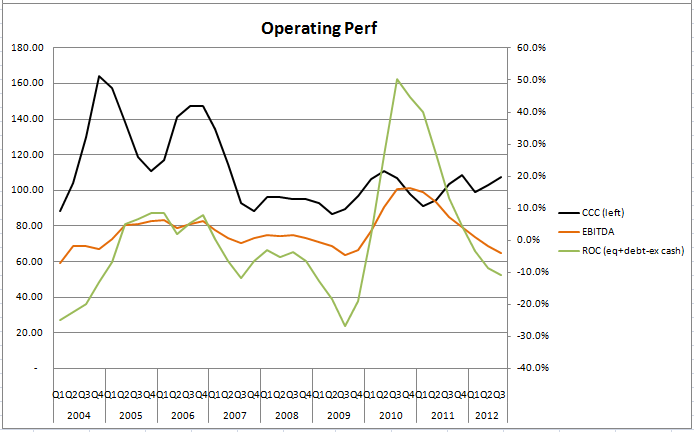 Here is a quick look at RFMD’s operating performance. To round out some numbers I also looked at AVX Corporation (AVX). Though not a direct competitor, they have similar characteristics. 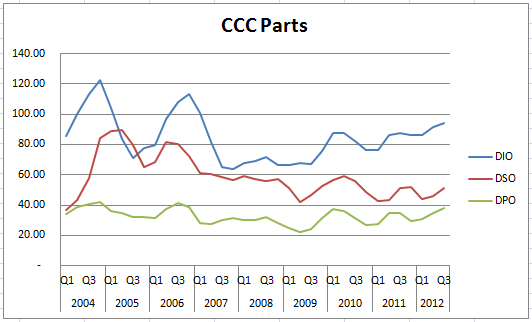 It shows the year end ROIC numbers for CTS. It visualizes what you need to know about this industry as an investor. You are not getting anything with franchise value. 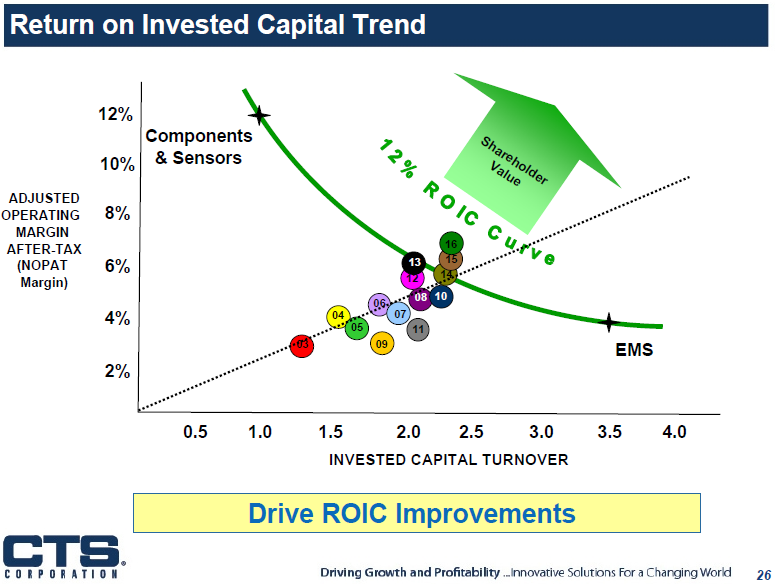 Over a 10 year period you are likely to get return on capital equal to cost of capital. Now you understand the industry lets look at some of the current valuations in the industry. We are not looking at earnings as they are depressed. We want to see the balance sheet numbers and potentially the top line, but remember with this little product differentiation the top line is volatile too. 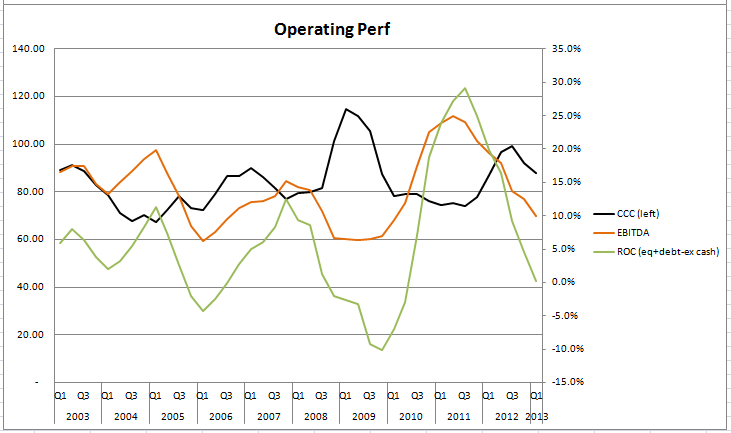 Most companies offer valuations similar to CTS and AVX. They trade near or below tangible book. Some trade under, but for the most part tangible book is decent enough. LGL stands out as the cheapest company. To be fair, it has a lower ROC than it’s competitors. Here is a look at LGL’s business performance. Here is a look at the income statement. 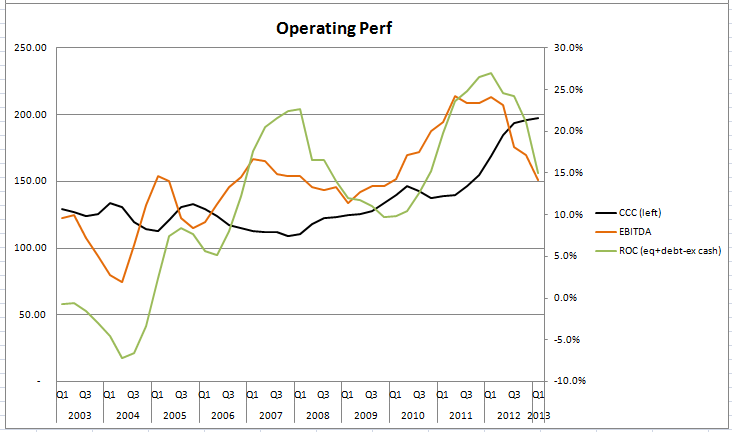 We can see that revenue and margins have been flatish until the recovery after the recession in 2010 and 2011. EBITDA has been nearly break even for almost 6 of the last 8 years. What immediately scares me at first is how can a company survive with break even or negative ebitda, unless they are constantly raising capital? Though share count has increased over the years, it is mostly due to options. TB/share is around $9.50, flat from the start of 2011 and double from the end of 2009. The major reason for this is that capex has outstripped depreciation over the years. It’s only recently that the company has spent more than maintenance expenditures. This is likely from two sources: 1) the CEO (Greg Anderson) has only been with LGL from 2009 and seems to want to grow top line numbers and 2) the company’s products have gained some share in the market as the spend to increase the number of cell phone towers (where some of LGL’s products are placed) and timing devices has risen. Here is the valuation the market has placed on LGL over the years. 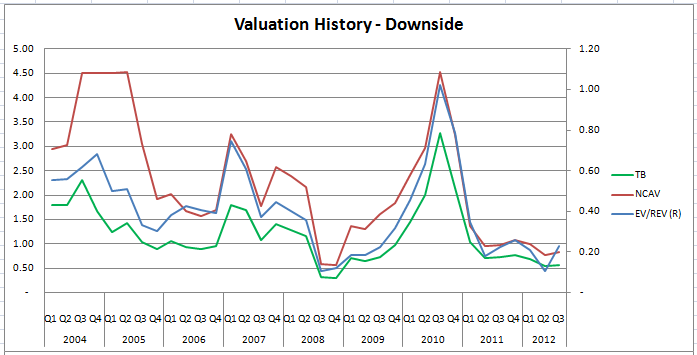 As you can see we are near the valuation seen during the great recession. This means the market is expecting around the same out of LGL as it did during the great recession. Furthermore there is reason to believe that LGL is trading at less than liquidation value (or NCAV). Before I get too carried away, we need to look at all the pieces that make up NCAV. Listed below are the % of total assets and then % of NCAV. This gives me comfort to know that LGL is not piling up (obsolete) inventory or giving credit (accounts receivable) for the sake of higher sales. See below for a breakdown of the CCC. Days Inventory Outstanding has crept up over the years, but I don’t believe it would instigate a write-down. There is $9.51 worth of tangible assets on the balance sheet. This is nice because if I am wrong about using NCAV as the liquidation valuation, I could have an additional $3 per share in margin of safety. Of course there are risks. Just like many NCAV stocks, the biggest risk is likely lack of a catalyst. Sure the company is cheap, but it can stay cheap (or get cheaper). You don’t get paid to wait either, that would be nice. The CEO owns about 50% of his annual salary worth of the company. That may not be enough to push him into returning some cash to shareholders or investing in the business when it needs to be. The board is independent with Marc Gabelli being the Chair since 2004. There is of course some bad news regarding Marc. Though he does own 13% of the company. Mario Gabelli owns about 16% of the company. There is no shareholder rights plan. The business could also be changed permanently and actually eat significantly into the balance sheet or what I am using as my margin of safety. Disclosure: The author is long LGL at time of writing. Hi Dean, we’ve spoken about Maxim Power. You should revisit the name as they recently announced the are selling their French and American assets. I also think they will be selling their coal mine, but that may take a while to find the right buyer. I think the sum-of-the-parts are worth north of $4.50. Investors are mostly hedge funds/billionaires who want to realize their investment. Also, I’ve been looking at Providence Service Corporation. There have been many comparable companies taken out at significantly higher multiples. A hedge fund has purchased a significant portion and ousted management. We could see the hedge fund sell this business after a margin turnaround. I like your McCoy pick. The stock will see a great 2013. I’m looking to increase my position in that stock following the company’s awesome Q3 results. And finally, take a look at Galvanic Applied Science…micro-cap with amazing earnings growth and excellent balance sheet. You’ll likely have to be patient with this one (similar to C-Com). Thanks for all the comments Michael. I will put both on the to research list and I’ll take another look at MXG. I agree with you on McCoy. The latest results certainly exceeded my expectations. The cash on the balance sheet gives me comfort and management seems to really think strategically, especially when compared to their peers. They really seem to take advantage of slowdowns rather than just react to them. Feel free to reply or shoot me an email. What are your thoughts about Gabelli(s) doing the right thing for shareholders and looking at alternatives (sell off money losing businesses, etc)? Mario does have a reputation to protect. I don’t have an idea of what the Gabelli’s are thinking on LGL. It needs to be made clear that Mario Gabelli is not the Chair, it is his son Marc. He has been on the board for 8 or 10 years and takes no compensation. I think the biggest risk short term is the margin of safety (asset value) deteriorates while we wait for a run in top line numbers. 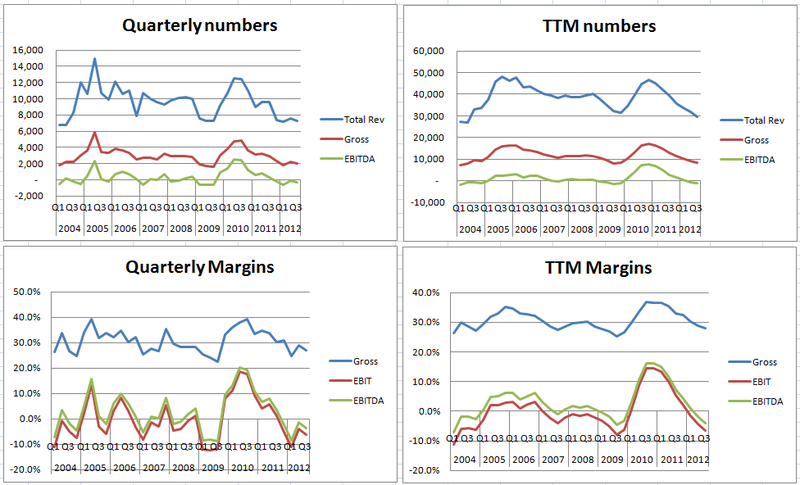 TB value has been steady for 6 quarters, but the extreme drop in revenue has created the cash burn situation. If business activity continues to deteriorate, then then LGL will start to eat into my margin of safety. I am watching backlog, as I don’t need a major uptick in revenue, just stabilization to wait out the storm. I do think that LGL is in enough of the right places for the market to eventually return, but who knows when. Dean, I think Marc Gabelli does take compensation. According to the last proxy the company filed, he made $373k in 2011 and according to the last 10-k, he made $113k in 2012. So in the last two years he’s made about half a million – that’s almost 1/4 of the value of the shares he owns, at today’s stock price. Thanks Juan for the comment. You are right. The remaining directors take on average about 35k/year, not unreasonable. Gabelli did take compensation in 2011 and 2012, though he didn’t take compensation in prior years.